Recently the focus of any outfit has become the trainers that complete it, a good runner has become this seasons biggest fashion staple. 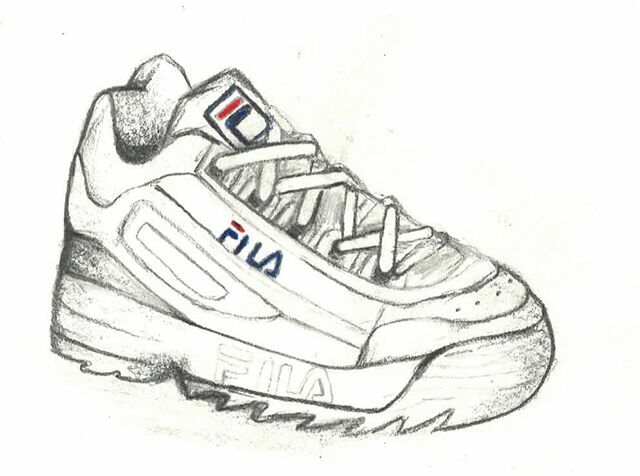 From the obsession with the Nike and Off-White collab to the smaller scale mania over the latest Fila runners, it seems everyone wants to keep up when it comes to this trend. With some people even going as far as to camp out to have a chance at grabbing the latest and greatest shoes, before they sell out at the usual lightning speed. From the classic fully white trainers, like the timeless air forces to the new bulky and multicoloured ‘dad shoes’ or ‘ugly shoes’ trend, they’re everywhere, but why have they become so trendy all of a sudden? On the catwalk, we have seen brands such as Balenciaga showcasing the same colourful block like shoes, and has definitely been picked up and shown through street style. The Instagram influencers have been littered with these designer shoes as well as dupes. Statement sneakers have been gracing the feet of everyone, from celebrities to high fashion models. At the beginning of the 20th century when companies like converse began to roll out a whole new type of rubber-soled shoe, we began to see what started as sportswear shift into something more. As runners were adapted for streetwear, they became much more creative, a unique runner can be used as a form of expression, much like fashion in general. We saw the spread of sneaker culture from the NBA when it enforced a dress-code to the hip-hop community in general, to its steady rise to being easily one of, if not the most popular choice of footwear in general. The luxury sneaker is nothing new, with Air-Jordans being one of the first and most critical examples of this. These sneakers became a part of the culture within some American communities, becoming a symbol of their common values and ideals. The reason we have seen the spread of the sneaker has a lot to do with the spread of these ideals. This shift has been reflected too in the catwalks this season with every major fashion brand from Gucci, Acne, Yeezy, right up to Prada all focusing looks on the sneaker. Some major high fashion brands such as Kanye West’s Yeezy focus always on centering the runner. These brands realise that a bold statement sneaker is a way to tap into the ‘hypebeast’ market and target the people who willingly and eagerly wait for the newest and ‘boujiest’ sneakers to drop online. We’ve even seen brands such as Zara and Boohoo take inspiration from this and make some pretty good dupes. So if you don’t have hundreds to shell out to, keep up with this trend, you don’t need to worry.